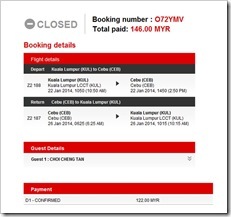 I took advantage of the AirAsia Free Seats Promotion for my international travel trip. The Free Seats Promotion is not a gimmick as I managed to grab & enjoy it. Let thanks to this great man, Tan Sri Dr. Tony Fernandes, the founder of Tune Air Sdn. Bhd., who introduced the first budget no-frills airline, AirAsia, to Malaysians with the tagline “Now everyone can fly”. Yes I totally agreed with the motto…”Now everyone can fly”! Without AirAsia, most of us would probably spend a bomb on the flight tickets alone. So far about 98% of my overseas travel was with AirAsia. You must be very fast to grab the Free Seats once once it was announced as the seat availability is very limited. My booking was done on two months before the travel date i.e booked on 14 November 2013 & travel on 22nd January 2014. AirAsia Free Seats don’t means you don’t pay anything. You still have to pay the fuel surcharges and airport taxes. It cost me only RM146(inclusive of Pak Nasser’s Nasi Lemak @ AirAsia In-Flight Meals) to buy the return flight to Cebu from the Low-Cost Carrier Terminal (LCCT). • Fare includes fuel surcharges and airport taxes (except for selected airports where airport tax is collected at the point of departure). This entry was posted on Monday, February 3rd, 2014 at 11:18 am	and is filed under Travel. You can follow any responses to this entry through the RSS 2.0 feed. Both comments and pings are currently closed.